This article gives a general overview of Nimble Mobile CRM 3.0 and how to get the most from our new mobile workflows. Access to Nimble anywhere the iOS Share Menu is supported. Research contacts and companies from within Mail, Contacts, Calendar, LinkedIn, and Safari/Chrome. Learn more. Email and Twitter conversations are synced directly to mobile contact records. Templated and trackable emails make outreach quick and easy. Multiple pipeline manager helps you manage opportunities such as sales, renewals, business development, marketing, or PR. Learn more. Business card scanner - the easiest way to add new contacts with the snap of a photo. Learn more. What features come with my plan? Business Plan - All features - calendar sync, contact list, email tracking, message sync, message tracking, multiple deal pipelines, business card scanner. Legacy Plan - Calendar sync, contact list, email tracking, message sync, one deal pipeline, business card scanner. Once you've added the latest version of the Nimble app to your mobile device, it's time to get started. To enable syncing of Emails and Twitter conversations, make sure your networks are connected in the Nimble Web App at https://app.nimble.com. Navigate to Settings >> Networks & Imports to connect your Twitter, G Suite, Gmail, Office 365, or IMAP email accounts. Once connected, the same conversations that display in the Nimble Web App will display on your contacts in the Nimble Mobile app. Navigate to the Contacts tab and open a contact. Open a contact record and swipe right to reach "History". From the history view, you'll see email & Twitter conversations, logged notes, and tasks in a clear stream of activities. Nimble Mobile now lets you send and track emails through the Nimble app interface. By enabling push notifications in your Mobile app settings (iOS only), you will be able to see notifications for when someone opens or clicks on a link on your mobile device. If you do not enable push notifications, you will only see this report from the Nimble Web App. Navigate to a contact record and select the email envelope icon. Select "Enable Nimble Tracking" to track this message to the Web App and/or Push Notifications. Write your message from scratch, or load a templated email. Note: templated emails must first be created in the Nimble Web App. Learn more here. The iOS Share Menu is a system menu that is accessible in many of your iPhone apps, including: Safari, Chrome LinkedIn, Mail, Calendar, and others. You're probably familiar with using the Share Menu to forward links to email or text messages, or to post interesting articles on social networks. 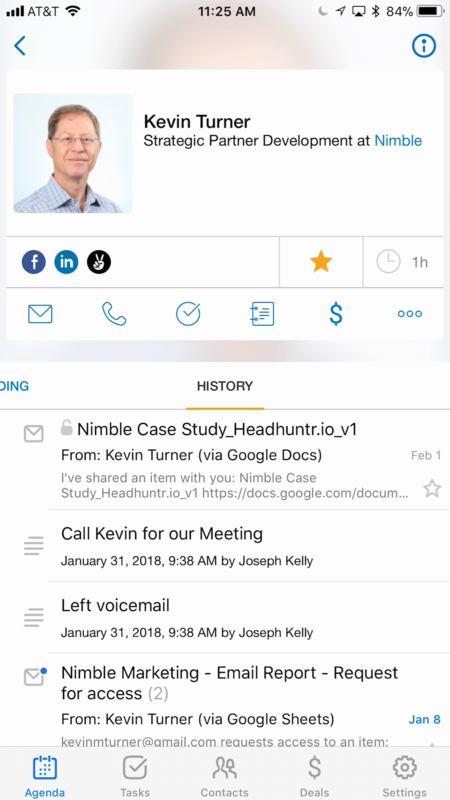 We added support for Nimble on the Share Menu to let you use Nimble's social search to build new contact records on the fly and to also look up existing records. Think of it as a mobile version of our Nimble Smart Contacts App that you use in your desktop web browser. 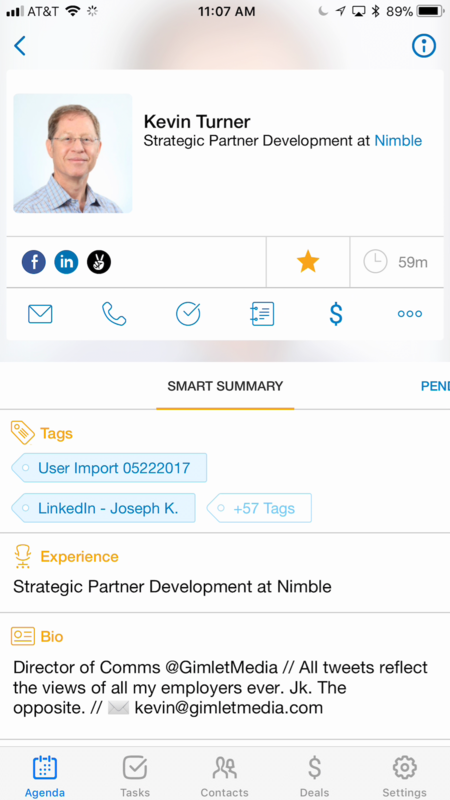 As you can see in this example, the Share Menu is available on a LinkedIn profile record from the mobile app. By selecting the dots and then "Share via...", I can launch the Nimble app to build a Live Profile or load an existing Nimble profile. More uses for the iOS Share Menu are outlined in this article.